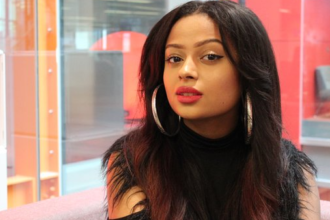 Singer Lola Rae, who recently became a mum, took to her Instagram to post the first photo of her daughter, Skye, who she shares with singer Tekno. This is coming, three months after Tekno announced the arrival of their daughter via Instagram. He had posted a screenshot of a sneak peak of newborn, with a caption that said, “Skye,” accompanied with love emojis. The couple has been on-and-off for years. 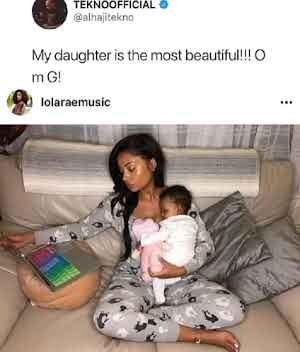 Late last year, Lola and Tekno hinted they had split up; they unfollowed each other on their Instagram pages respectively, the same had happened in August 2017. Now, the proud mama has shared their baby’s photo for the first time and fans are super happy for her, she also shared her post pregnancy look and a lot of fans believe she looks really good. She also seems to be ready to return to work as, on one of her recent photos, she had the caption “last one before I get back to this studio sessions”.